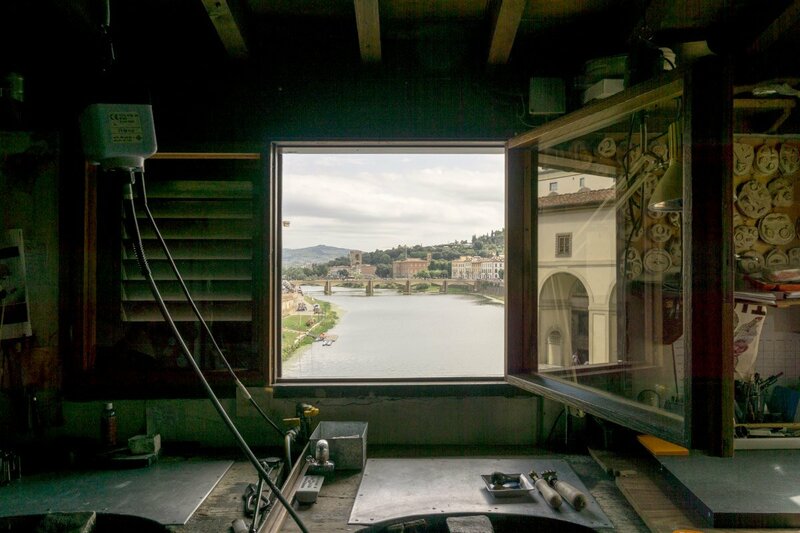 The best view over the Arno from a secret jeweler's workshop. All photos by Annie Ojile. We first met Annie Ojile in Rome where she brought Fathom founder Pavia Rosati on a whirlwind Vespa tour around the Eternal City. She's since brought her effusive love for all things Italy and her fashion connections to Florence, where she now conducts customized shopping tours. She gives us a few of her favorite stops, and sneak peeks to ones she won't mention. FLORENCE – My love affair with Italy began nearly 20 years ago when I was a student studying fashion and Italian in Milan. I fell hard for la dolce vita — the language, the people, the shoes. Of all the cities I visited during my first Italian adventure, the Renaissance fairytale that is Firenze was my favorite. When my parents flew to Italy — to literally drag me back to the United States — I left with so many dreams tucked away in my heart. At the top of the list was to work for Gucci in Florence. Instead, I was hired by DKNY, and this wide-eyed 22-year-old Minnesotan moved to the Big City of Manhattan. In theory, it got me one step closer to Italian soil, but it would be another eight years until I packed my Prada and crossed the pond to Italy. Even though I chose Rome as my new home, my love affair continued with Florence. At every opportunity, I would return to the magical town that now seems like a village compared to the capital city where I've lived for a decade. A few years after I moved to Rome, I launched a tour company and started leading Vespas tours through the Eternal City and arranging customized travel experiences throughout the Boot with my partner, who also happens to be my husband. Because I believe that I should turn my passions into work, last year we launched tailored shopping experiences in Florence. Our clients always ask us where to eat, drink, and shop, so after years of pulling out my little black book for Rome, Florence, and beyond, I decided to make it official. We now collaborate with all Made in Italy lines, boutiques, and local artisans in Florence and environs to show our clients a different side of the city. It's an richer immersion in the shopping culture of Florence — the history, the quality, and the tradition — are discovered through encounters with authentic Florentine artisans in our highly curated selection of boutiques. Our clients shop for gold and baubles in a 112-year-old workshop on the Ponte Vecchio and meet with an artisanal perfumer in a Renaissance palazzo to craft a bespoke scent. Those are just a few of my favorite stops along the way. Of course, shoppers can't come to Florence and not buy leather. We just want them to steer clear of all the crap flooding the market, so we take them behind the scenes to meet the artisan, learn about their craft, and perhaps walk away with a perfect souvenir. Here are a few of our favorite places to visit and the artisans who inspired us to create these custom tours. 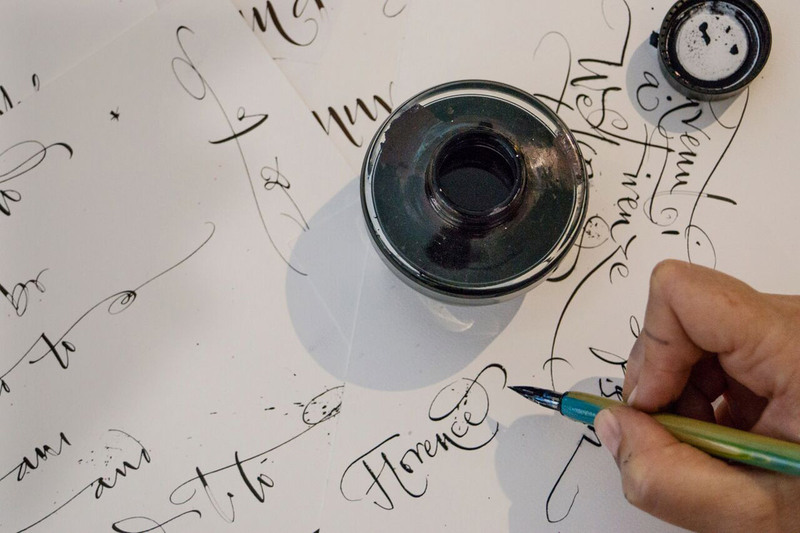 Betty Soldi gives a quick calligraphy demo. Located in my favorite neighborhood, Oltrarno on the other side of the Arno. 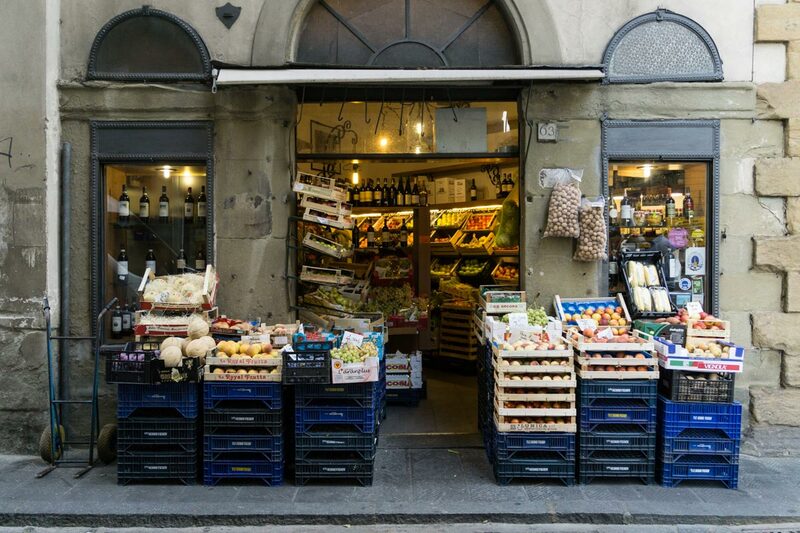 Cross Ponte Vecchio and head to Via Maggio, a must-see street lined with artisanal studios, boutiques, and antique shops. Opened by my friends Betty Soldi and Matteo Perduca, And Company is more than a shop. It's a creative space, a calligraphy and design studio with dreamy, witty objects and furniture. I can't leave here without stars in my eyes. Literally: Stars are Betty's signature. Born in New York City to an Italian-American family, Jen too had the dream of living in Italy, and Florence has been her home nearly ten years. Her leather handbags have a rich, hippie vibe and are the perfect combination of casual elegance and handcrafted, raw luxury. They are always my go-to, no matter what I am wearing or where I am. An avant-garde concept shop with a minimal bohemian style. Inspired by the underground neighborhoods in London, Berlin, Antwerp, and Brooklyn, it's located in Sant'Ambrogio, the artsy, literary quarter of the city. The spirit of the store is very Dadist: Owner Massimiliano Gianelli originally opened it as a workshop where he could vent his creativity. It didn't take long before it grew into an experimental haven and started offering a unique collection of European labels. While you're here, don't miss the outlet shop of Florentine fashion staple Luisa Via Roma, which around the corner at Via Silvio Pellico, 9. An insider has to have some secrets, and this is one of them. My favorite jewelry store on the Ponte Vecchio remains unnamed per their request. The third-floor atelier in the Vasari Corridor has been in the family for three generations, since 1903, and is today run by the founder's granddaughter. What makes this workshop even more special is the balcony onto the Arno. Which is just insane. We can arrange sunrise breakfasts and candlelit dinners here or other once-in-a-lifetime experiences. I'm hoping for a couple to get engaged on the balcony and go into the shop to design their wedding rings. Another secret address. I seriously can use my nose to arrive to this Renaissance palazzo since I can smell it from a block away. It's intoxicating! Every time I pass through their wooden doors and enter this old-world, urban oasis, all my cares fade away, and the sensory experience begins. I happily zen out in the three spacious rooms, looking at all the beautiful bottles, incense, candles, and soaps. The heart of the boutique is the Parlour of Essences, where the Master Profumer creates olfactory magic on his organ of 1500 single scents ("the organ" is the term for the collection of essences), crafting bespoke scents for a lucky few. Post-pranzo chit chat at 5 e Cinque in Piazza della Passera. I head to this tiny yet lively square great for people watching and snacking on delicious, non-touristy fare at Trattoria 4 Leoni and 5 e Cinque, a tiny new vegetarian organic restaurant. Sometimes I skip lunch altogether and head across the square for a large cup of the best gelato in town at Gelateria della Passera. The Incantesimo and Carezza flavors have been on repeat lately and are, to borrow a term from local hero Dante, divine. 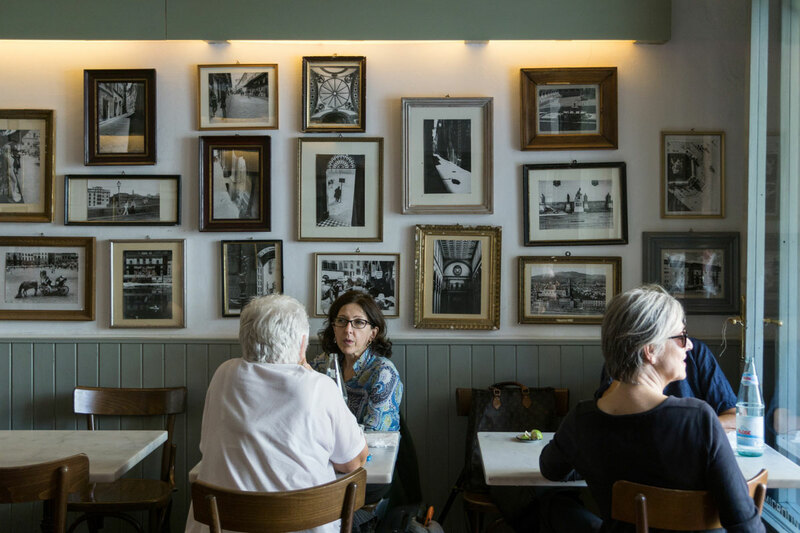 In the heart of the city just off Piazza della Repubblica is the newly opened Irene, located in Hotel Savoy and inspired by a '50s retro-chic bistro style. Every time I swing through town, I meet my friends for a serendipity cocktail or two. The whole place oozes fabulousness, and the wit, charm, and fashion of the restaurant manager Paul is enough reason to pop in. The Oltrarno boutique bed and breakfast, owned by the design duo Betty Soldi and Matteo Perduca of And Company Shop, has eleven impeccably designed rooms, each more delightful than the other, that are a perfect mix of vintage pieces, playful design, and original frescoed ceilings. Betty and Matteo are already meticulously working on their next dreamy Oltrarno project: Ad*Astra is due to open this fall and will be the first hôtel particulier in town. It is the gorgeous collaboration of architect Francesco Maestrelli with Marco and Matteo Perduca. There are only seven rooms on the piano nobile of a villa that has two secret gardens. This time around, they will be using Italian design from the 1950, '60 and '70s, encompassing traditional Florentine colors. Swoon. Inside a jeweler's workshop, a secret perfumery, and the best view over the Arno. To create a Personalized Italy shopping experience, contact Annie at hello@personalizeditaly.com and +1-612-216-2460 or +39-338-822-7671. And tell her Fathom sent you! Annie is a Vespa guide in Rome, Italy. You can follow Scooteroma's adventures on Twitter, Instagram, Pinterest, and Facebook. She travels for the wheels and the bubbly, in that order.